Look at that thing. It looks like a teddy bear mated with a powder puff and a set of meat hooks. It has giant claws and a spiked mucousy tongue, and it kills 5,000 things a day. And it’s still adorable. The silky anteater, shown above being utterly content with its place in the world, is the cutest possible hand-sized ball of ant murder. Although the biggest things on its entire body seem to be its polished claws, and although it does rise up on its hind legs to brandish them if threatened, it is characterized as “non-aggressive,” which, of course it is. It has no teeth, it barely has any ears, and its main defense strategy is sleeping on the silk-cotton tree, curled up in a ball so it resembles a puffy seed pod. 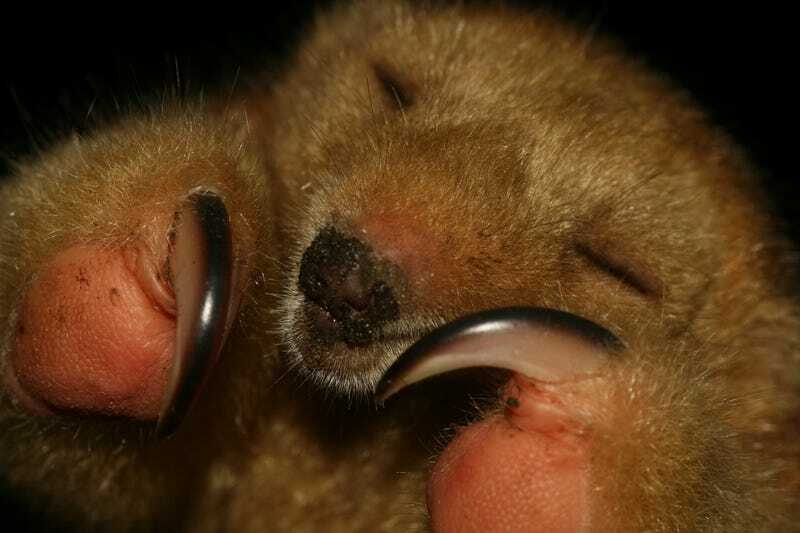 Which isn’t to say that silky anteaters can’t be fearsome. They are very well designed to hunt ants and beetles, and take in 5,000 of them per day. They have little barbs on their tongues to puncture the ants, and their tongues have mucus coatings to stick the ants. A silky anteater is a terrible way for an ant to die, but that’s hard to keep in mind when you see one doing its impression of a rainbow. If you were heartless enough to take a blood sample from one of these creatures, you’d find out that they are an interesting remnant. Myrmecophagidae, a family of anteaters, has a tendency to merge its chromosomes. But the silky anteater, secure in its abundant chromosomes, doesn’t share that tendency. It split from its closest relatives 33 million years ago, and retained its chromosomes while the other anteaters were merging theirs. Consequently, it has the largest number of chromosomes in its family, and is a genetic (if not physical) remnant. Sixty-four chromosomes, no teeth, all cute.